So there I was, walking through Dicks Sporting Goods looking for a new toy and I came across the LiveTarget Hollow Body Sunfish. LiveTarget Hollow Body Sunfish got me HOOKED! 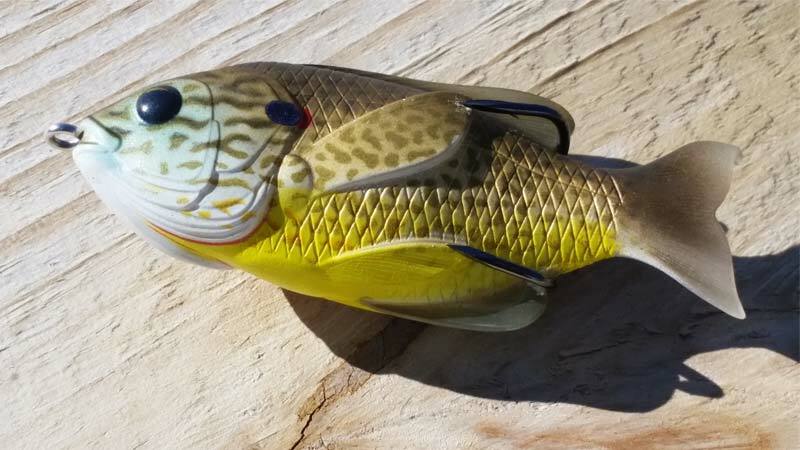 The LiveTarget Hollow Body Sunfish is a weedless topwater lure. 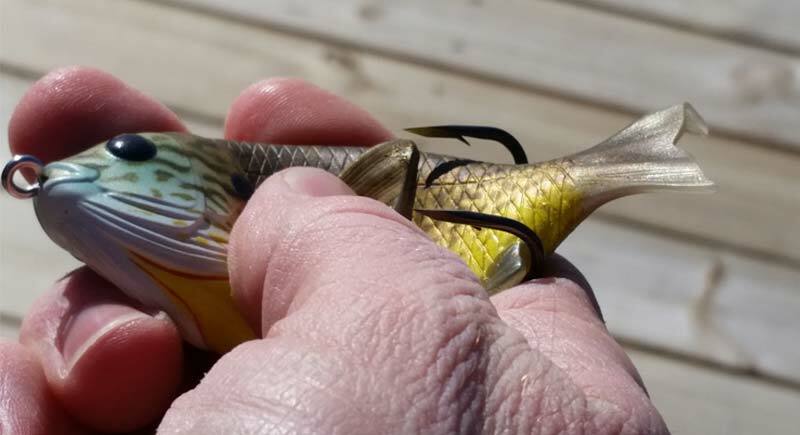 It’s probably one of the most realistic looking fish lures you’re going to find. It comes in 2 sizes, 3” and 3.5”, and on Amazon has about 14 different colors and patterns to choose from and it features a super sharp Trokar double hook (BE CAREFUL). 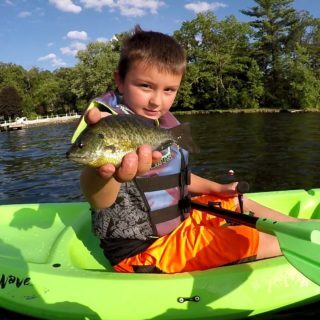 The LiveTarget Hollow Body Sunfish is so much fun to fish and the action is really impressive. It’s really 2 lures in 1. It’s a cross between your typical hollow body frog, and a “Walk the Dog” style Topwater lure like a Zara Spook. It mimics a dying sunfish or bluegill, and provokes some intense strikes and fishy acrobatics. It’s probably worth mentioning that this doesn’t swim upright like a normal fish would. When it’s in the water, it lies on its side like a dead fish. You can very easily walk it along side to side by leaving some slack in your line and pop your rod tip down. It’s super easy to walk, and actually goes back and forth over 180 degrees if you want it to. With tighter twitches it’ll make tighter and smaller turns. To pop it along and make a bubble trail, its basically the same motion, but a little harder, with less slack. It’ll literally jump into the air if you want it to, and look likes its trying to make an escape from a big predator in it’s final frantic moments. 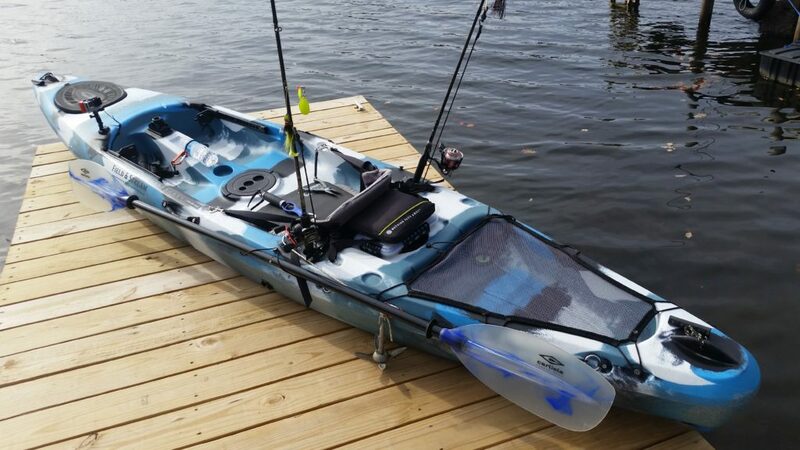 I don’t normally care too much about product packaging, but the LiveTarget Sunfish package really impressed me. It came with instructions how to fish it, WITH DRAWINGS! I can only think of 1 other company (Rapala) that ever included a pamphlet like this when you purchased their product. LiveTarget wants you to use this lure and succeed, it was basic, but it included some drawings of how to work it. You really can’t go wrong here. Cons? This is not a windy day lure, but I don’t know that they could have designed it much better. 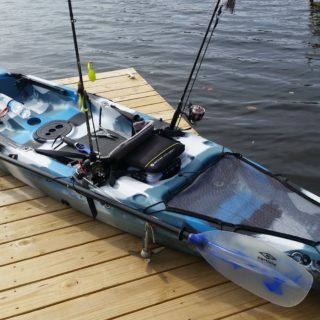 The LiveTarget Sunfish is basically the shape of a sail. 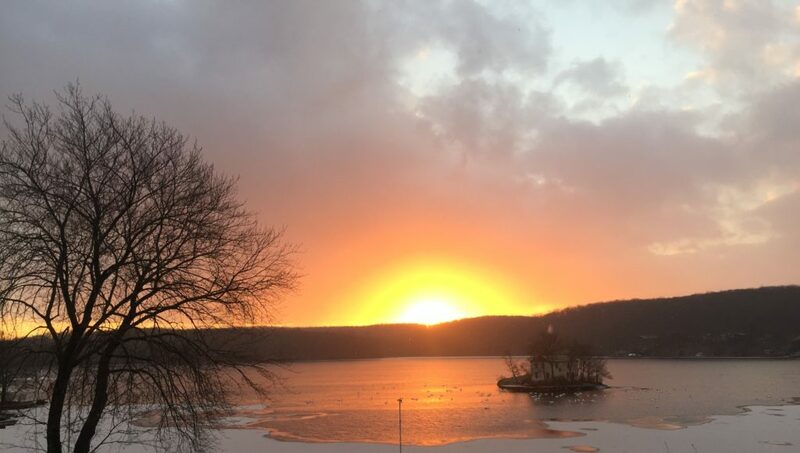 The wind blows, and it sort of stops in its tracks, and crashes into the water. It’s just not aerodynamic like other ‘walk the dog” style lures. In its defense, it was breezy when i was playing, ERR UM Testing… The only other negative I could think of was the price. I thought topwater frogs were getting pricey, and this was a few bucks more. But honestly, if you’re like me and like cool lures, its totally worth it. How can I write such a long article, and go into so much detail on 1 single lure? 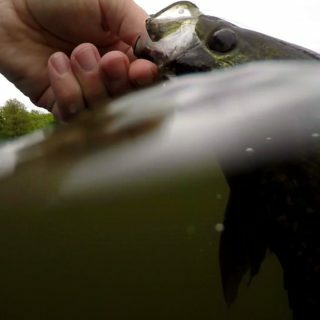 Because the The LiveTarget Hollow Body Sunfish is so much fun to fish and is super cool. It’s easy to work instantly, it does what you want it to do, and it really makes fish mad! I had so many follows from angry pickerel back to the dock, leaping into the air after this thing! Just like a frog, I lost more fish than I caught, when you see or feel that hit, count to 2 Mississippi’s before you set the hook, or you’ll just rip it out of his mouth. BUY IT! If you’re reading this it’s because you’ve been following me or are a close friend. Or despite all my mistakes you’ve somehow managed to stumble in here from an organic search… If you’re not reading this yet it’s ok, you’ll find us soon enough, and start following too because we have a New Years Resolution. We’re setting goals for FishinEdition and for the website to build a community of fishermen and fisherwoman, outdoorsmen and outdoorswomen (if that’s a word? ), friends and neighbors… You get the idea here…. 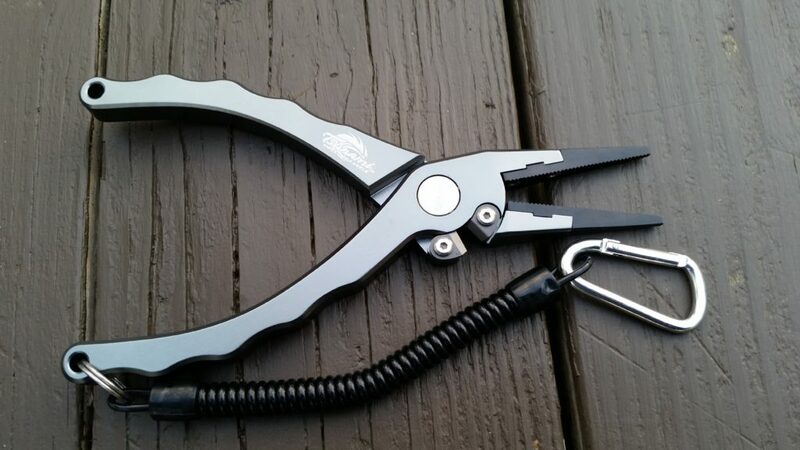 Fishing pliers is one of those items you don’t really need to go fishing until you do! Having a good set of fishing pliers on you whenever your fishing can save a fishes life when practicing catch and release. In worst case scenario pliers can save your life if you fall victim to a survival situation, or in a more likely scenario where you get a hook stuck through your hand. Fishing pliers don’t have to be expensive or top of the line to be useful, but do you absolutely no good if you leave them home, or drop them overboard. I choose the Tsunami 7.5 Ultra Strong fishing pliers by Bimini Outfitters for a number of reasons. Most of all, they’re very affordable and I can’t drop them overboard if they’re attached to my body. Taking Kids Fishing, sunnies with my son! 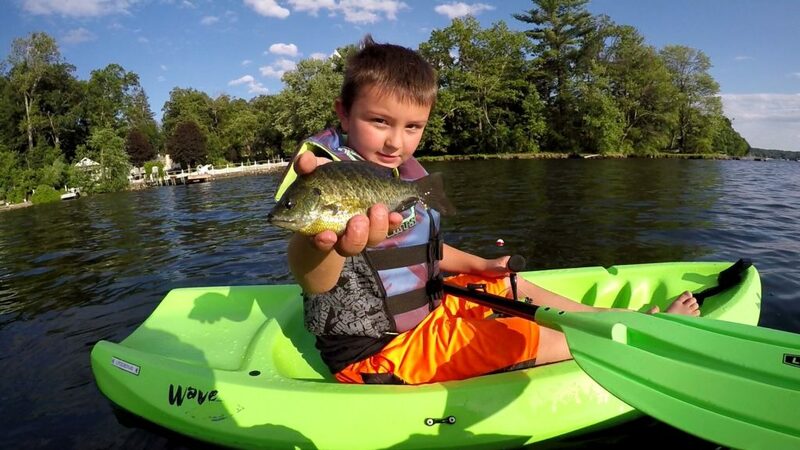 Taking kids fishing can be frustrating sometimes, but if you do it right can be such a rewarding experience. You have these expectations of you and your boy or girl being out of the water all day reeling in monsters together. I can tell you from experience taking kids fishing is not exactly like that. I’ve read this so many times and it’s so true, it’s not about YOU, it’s about them. Make THEIR day a super fun adventure without worrying about the catch.